Born: 23rd March 1892 Fairfield registered Chapel-en-le-Frith Vol 7b Page 824 A/M/J. The son of Samuel & Annie Volans. William was baptised on 20th April 1892 St Peters Fairfield. 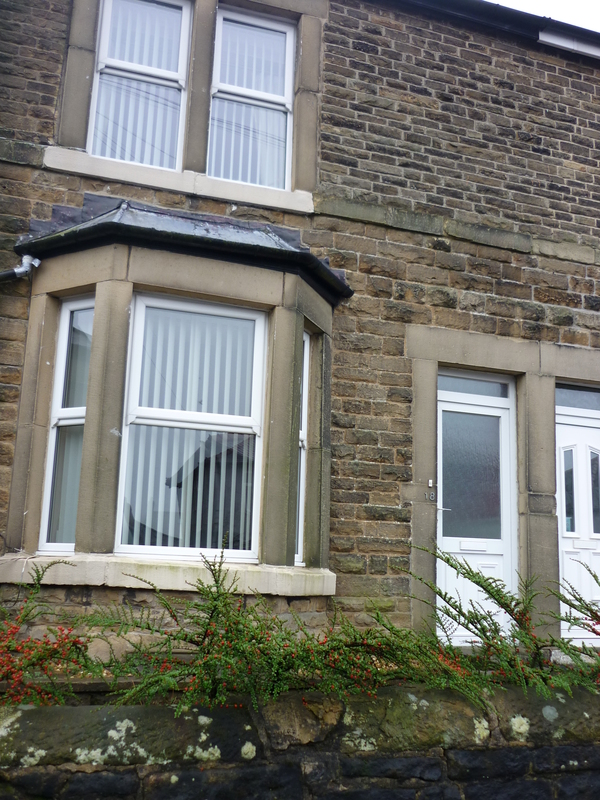 William started North Road School on 17th May 1897, the family were living at 11 Hogshaw Villas. 1901 When sister Gertrude started school in April 1901 the address for the family was given as Ivy Dene? Lightwood. I am unable to locate the Census. However there was Dad Samuel, Mum Annie, older sister Maggie, younger sister Gertrude & younger brother Noel (all the children attended North Road School). 1911 Census: Boarder 69 Hardshaw Street, St Helens Aged 19yrs, working as a Shop Assistant in the Butter Trade, Mum Annie is now a Widow living 18 Windsor Park Road, Fairfield. There was another sibling Alice. 1916: Mum living @ 13 Queens Road, Fairfield. Sergt. N. Volans, & Pte. W. Volans two of the son’s of Mrs Volans of Queens road, Fairfield, and well known in Buxton. 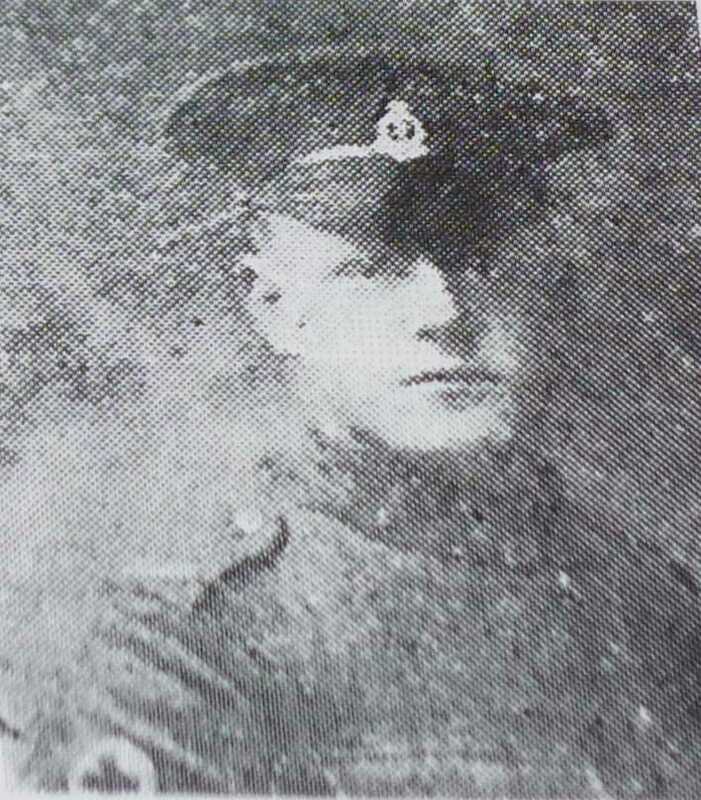 Noel the Sergeant, is the younger one and was prior to the war, employed at Messers. Hulley’s and Wright’s. In August 1914, he went with the Ambulance Brigade, and was attached to the R.A.M.C. at Aldershot; he was one of the few who stuck to soldiering when he started and is now Sergeant Instructor and stationed at —–. 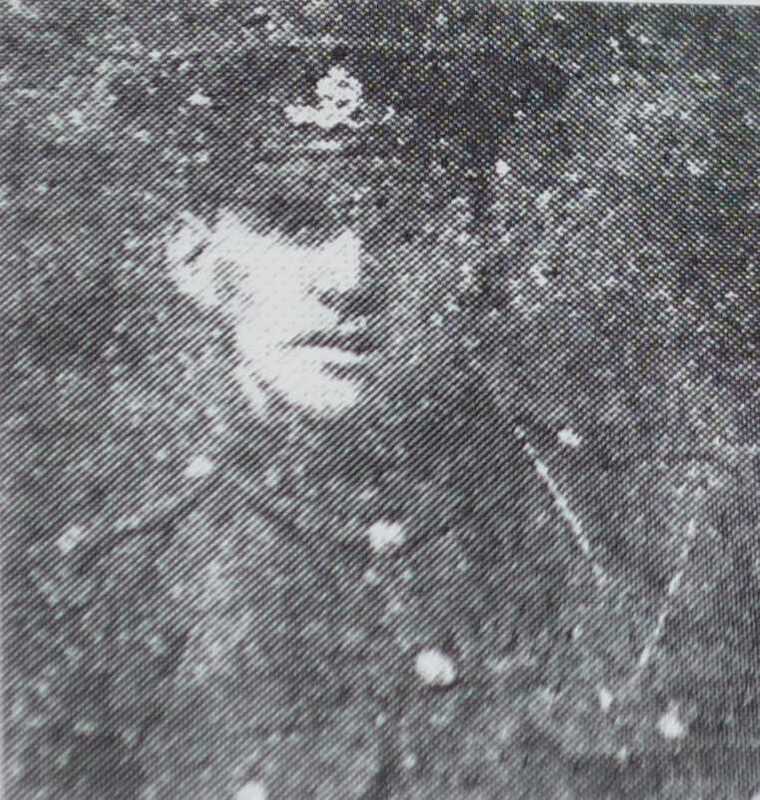 William Volans joined the Royal Garrison Artillery in November last. He was in the Manchester City Police force for 4 ½ years. During that time he was missed by a good many friends in Buxton. He has been stationed at ——, and is now training with the 115th Siege battery at —–. These two brothers are a fine example to shirkers and “Conscientious” objectors, and we wish them both the best of luck and a safe return to Buxton when duty is done. 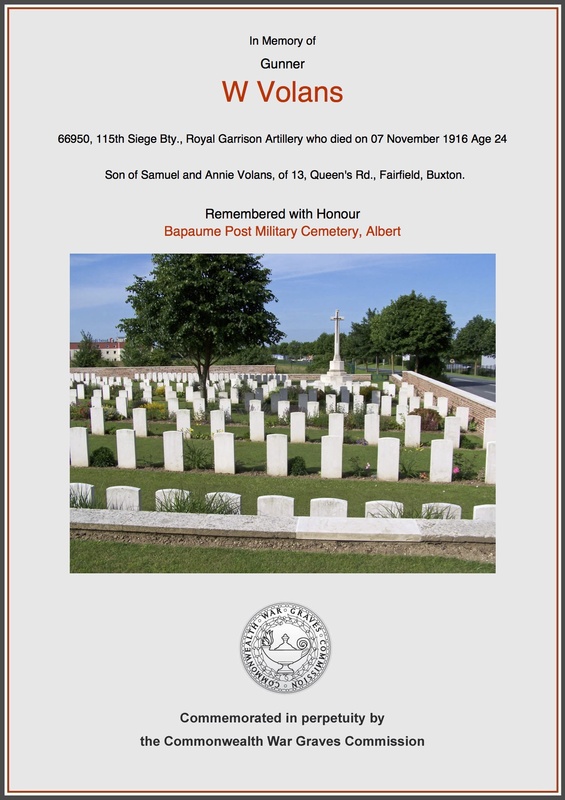 It is with sincere regret we chronicle the death of Gunner William Volans, of the Royal Garrison Artillery, which took place on the 7th inst. He was asleep in his dug-out when a shell pierced it, and he was killed instantaneously. He was buried a year to the day of enlistment. Gunner Volans was in the Manchester City Police for 4 ½ years. He was the son of Mrs Volans of Queens Road, Fairfield and always wrote home the cheerful letters. He went to the front with a brave heart and in the best of spirits. Deceased will be missed by a wide circle of friends, both in Buxton & Manchester, with whom he was always very popular. A very sympathetic letter has been received by Mrs Volans from Major Robertson, who states that Gunner Volans was buried in a cemetery by his comrades. Major A. L. Burch Canadian Chaplain wrote Mrs Volans as follows:- “Dear Madam,- Before this letter reaches you, you will, in all probability, have been notified by the War department of the death of your son, Gunner W Volans, No. 66950. It is little comfort one can offer to a mother at a time like this. Death is expected and in ever increasing proportions, and yet when it strikes an individual its reality is as deep as human emotion. I a parent deeply sympathise with you. My purpose of writing is to apprise you of the fact that your son was buried in one of the regularly appointed military cemeteries in this area, and that I, a Clergyman, committed his body to the resting place of a real soldier. Unfortunately I am not permitted at present to name the cemetery, but you can obtain the information from the ‘Director of Graves Registration Commission, War Office, St James’ Square, London.’ A cross erected by your son’s companions, will mark the grave.” Second Lieut Baynes has likewise communicated with Mrs Volans, stating that her son was killed instantaneously in the night while sleeping in his dug-out. It would be some consolation to know that he could not have suffered any pain. The writer adds “He was in my sub-section, and layer of my gun, a responsible post, which he always carried out as well as could be desired. He was very popular in the Battery & made many friends. We shall miss him very much…..I know that the whole Battery will wish me to send you on their behalf a message of sincere sympathy in your loss.” With the bereaved parent and relatives the sincerest sympathy will be felt.